YouTube Next Lab’s Hungry Nation challenged me to a Fresh Five so I pulled out the abacus and Google analytics to calculate the Top Five Most Popular Celebrity Chef Recipes on AverageBetty.com! Whose recipe will reign supreme? Watch my Fresh Five to find out. Fresh rice noodles with Thai basil, sweet soy sauce, chilies and onions. And a little magic according to Chef Jet! You might not have a 250,000 BTU Pow Wok at your house, but that doesn’t mean you can’t try Chef Jet’s Drunken Noodles at home. 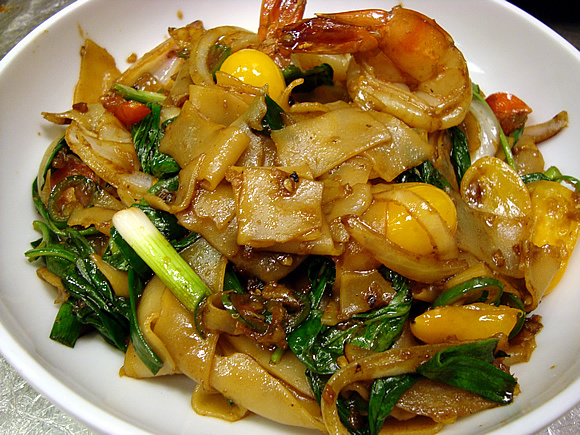 Get the Drunken Noodle recipe here. Watch the video here. No question, Thomas Keller is revered for many reasons, but his famous Ad Hoc fried chicken is the stuff of which legends are made. Get the recipe here. Buy the award-winning cookbook here. Watch my interview with Thomas Keller at The American Wine & Food Festival here. Guess I’m not the only one around here obsessed with fish tacos! 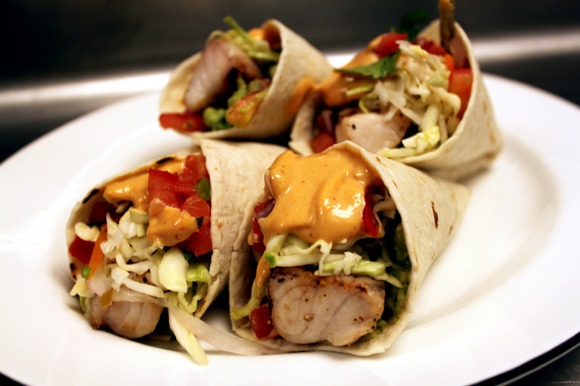 Get Chef Scott Linquist’s Grilled Baja Style Mahi Mahi Tacos recipe here and get all of Chef Linquist’s Mod Mex recipes in his cookbook. Watch the video here. Big showing for the newcomer! 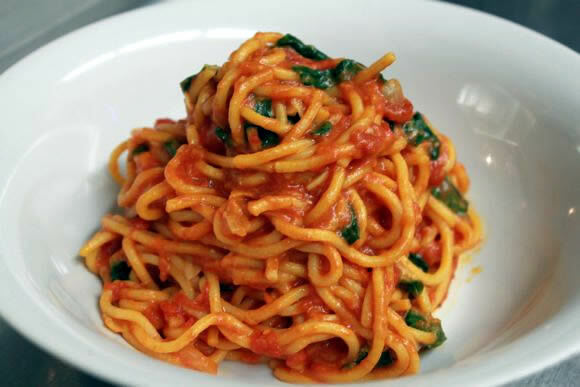 Spaghetti Alla Chitarra — Fresh spaghetti with San Marzano Tomatoes, Peperoncino and Basil really is Love in a Pan! Get the recipe here. Special video bonus: Chef Vic explains how to keep fresh pasta from sticking. Watch the video here. Although I can’t recommend the pyrotechnics of Chef Fabio for home cooks, his Chicken Marsala is as traditional and Italian as Fabio, himself. 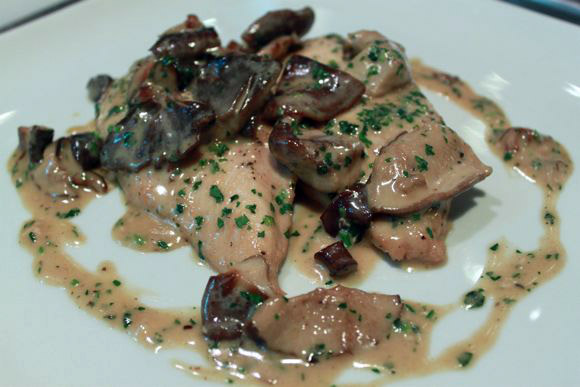 Three kinds of mushrooms, Marsala wine, heavy cream and just the right amount of machismo reduce into pure Fabioloso! Get the recipe here. Watch the video here. Made Hasselback potatoes today…my mom loved them…she loved the fan look they had…she was impressed…but I gave credit where credit is due..and she had keep watching that “Average Betty” show if you are going to cook like this! Hi seti! Emeril is great – I’ve never met him, but sure would love to. Scott Linquist is great. funniest interview I’ve ever had! Please….I begging….you have to do something with that John Mitzewich character. I “discovered” your blog because of Chef John. I Loved your cameo in his Eggs Benedict video!